A low cost reward for your children's ministry with the added value of teaching God's Word, the excitement of collecting and trading plus the ability to play a game! Some comments received from those using Ultimate Adventure Cards. Cards are a real hit! Cards arrived next day. They are a great idea. Looking forward to using them in our Children's Ministry. Cards are proving very popular, with children looking for shinies. Cards get the kids interested in the Word. Prices reduced while stocks last! Ultimate Adventure Cards are designed to teach children God’s Word and can be given as rewards in your children’s programme and outreach events, to encourage attendance. There are 120 different characters to collect. But with the additional 40 "shinies", there are 160 different cards to collect. Please note that only 20 "shinies" are supplied for every 5 complete sets of OT or NT cards (e.g. 5 sets x 60 = 300 + 1 sets x 20 Shinies = 320 total) therefore "shinies" are rare cards and not everyone will be able to collect them. Children and leaders can trade Ultimate Adventure Cards to complete their sets. Each Ultimate Adventure Card details a Bible character and is part of a set of associated characters. 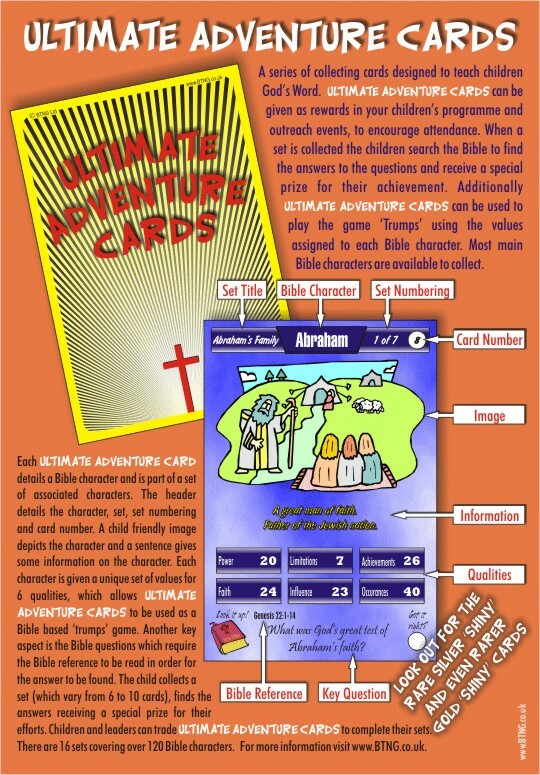 Each character is given a unique set of values for 6 qualities, which allows Ultimate Adventure Cards to be used as a Bible based ‘trumps’ game. Also included with each set is an instruction card for playing the "trumps" game using the values on each card. Another key aspect of Ultimate Adventure Cards is the Bible questions which require the Bible reference to be read in order for the answer to be found. When a set is collected (which vary from 6 to 10 cards) the children search the Bible to find the answers to the questions, which encourages them to continue collecting the cards and reading their Bible! Additionally each Ultimate Adventure Card has a unique number in the top right hand corner which help place the cards in order. When this is done, you will be able to journey through the Bible in the order that the characters appeared and the events occurred in history. There may be a little overlap here and there particularly in the NT but care has been taken to try and achieve the order. The exception is the Spiritual Beings set.